Learn how to respond to your complaining child using “wants” and “wishes” phrases. Free printable list with the positive parenting phrases to stop a whining child. I arrived at my daughter’s daycare in the afternoon to pick her up. 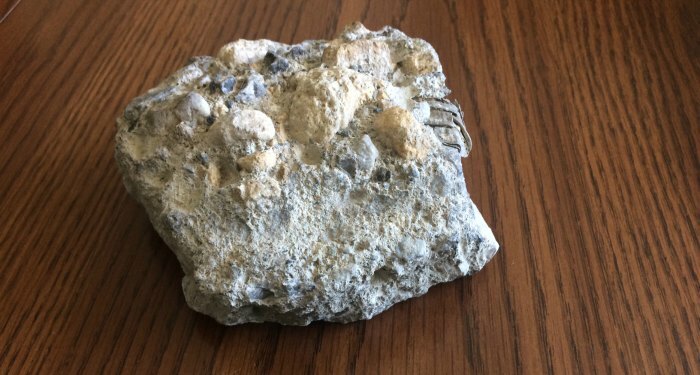 My son was with me, and as he exited the car, he picked up a gnarly-looking 5-pound rock. He held it above his head like he was going to impulsively launch it in the street or at another car. Through my Language of Listening® classes and training, I’m working on how I respond to my kids. In these types of situations, my response dictates whether we engage in an endless power struggle or build relationship and understanding. Unsure about what to say, I told him that rocks weren’t for throwing and that I wasn’t okay with that. He picked up a small rock and threw it. He wanted to keep the big rock and I told him that he could have it when we came back out. I was working hard to trust him with this. Do you have a complaining child? “But I want it now! Then I would get all huffy and frustrated because I viewed him as defiant and ungrateful. Using these responses, you immediately connect with your child’s inner greatness and center your child back with who they really are! Sandy always teaches that the more you name behaviors you like, the more your children show you those behaviors. So smart, right? Once I changed my response (and shifted my perception), everything fell into place. Here’s a list of things you might hear from a complaining child and 10 positive ways you can respond using “wants” and “wishes” to change the entire interaction! Try…”You wish I were nicer.” (Child who likes nice people). Try…”You want a different toy.” (Child who knows what s/he likes). Try… “You wish you could make all the decisions.” (Child who likes to be in the lead). Try…”You want her to respect your belongings.” (Child who appreciates respect and courtesy). Try… “You wish things turned out differently.” (Child who knows what s/he wants). After picking my daughter up, we all walked back to the parking lot. My son immediately picked up the rock, held it over his head, and seemed like he was going to (gasp) throw it. He started placing the rock down gingerly all over the place. “Look here!” he would say each time he set it somewhere new. He brought it all the way home and put it all over outside walking into the house and all over the house showing me how he could gently place it down. I continued naming those strengths. The rest of the day, his behavior was calm, relaxed and cooperative. Instead of saying, “Put that rock down right now. How many times do I have to tell you to be careful? !” it was like I finally got the memo. He was trying to be careful. Now that I finally noticed, he didn’t need to test boundaries to prove to me the rest of the day that he was careful and trustworthy. I’m not always perfect with using “wants” and “wishes” to respond to complains, whines, pouts or behaviors I don’t like. But when I do remember to pause and notice what’s really happening, it’s easy to discover your child’s inner greatness. All kids are filled with greatness. It’s only a matter of pausing, recognizing, remembering to draw all that greatness out. 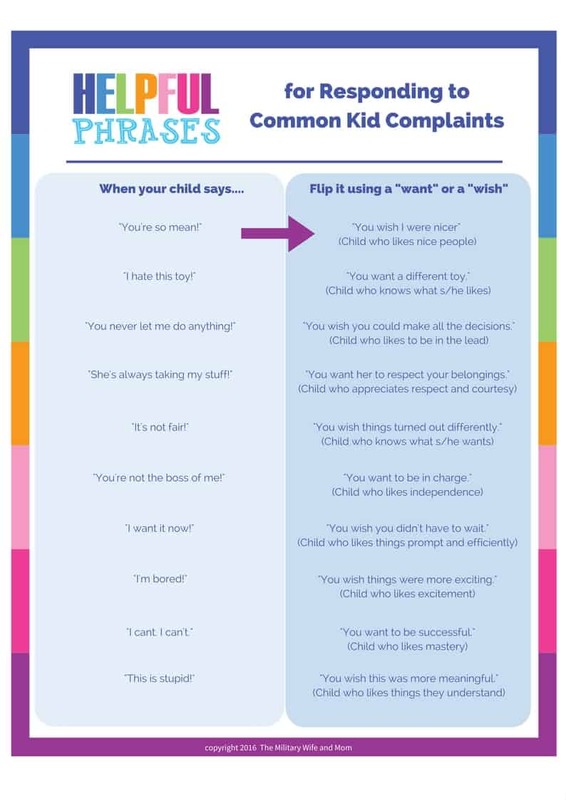 Use this handy printable sheet to help you turn your child’s most common complaints into a “want” or “wish.” It’s such an easy way to shift perceptions and turn an interaction with your child into a positive one! This is so true, Lauren! What a great way to think about whining—rather than seeing it as a hassle, we can decode it to see what they really want or wish for. It definitely helps with honoring the impulses and seeing acknowledging the intent behind their behaviors! Yes! Someone recently said… “All behavior is a communication.” So simple, yet so true. Oh, I’m so glad you loved it. I love your suggestions for turning it around to wants and wishes and to help kids understand what they’re *really* trying to say in a positive way. I’m going to use this little trick with my kids, thanks! I agree with a positive approach. Kids can tell to you the truth, and have the right not being punished for it. I hate to be negative but I think this is a load of crap. Kids are not always doing the right thing and they need to be told “Put the rock down!” in a firm, authoritative voice. Mind you, not a screaming or frustrated voice but a firm voice that sends the message that you are in charge. And if they do not listen, there should be a consequence strong enough to make them not want to do it again. Kids also do need to be taught to be grateful. If my child told me that they hated a toy I would respond that she needs to be thankful and possibly take toys away until she comes to appreciate the ones she has. What has happened to parent’s common sense?!? I personally want a child who grows up to be an adult that is respectful, resourceful and responsible. A child fearing their parent and skiing the ‘right thing’ builds rebellion and submission. I would rather have children who want to do the right thing and do it because they want to…not have to. Controlling parents….the fruit lasts longer than the time they live under your roof. The consequences can come when they are 30 or 45 years old and throw the rock because they never got to. Oppression never helps anyone. Love wins. Let us encourage our children to be good :). Not break them. I agree with Camila on this one to a point. I think a lot can be gained from hearing what your child is saying and understanding what that means to them, giving them independence in certain situations, and allowing them to make SOME decisions. You want to empower them to make informed choices and inspire them to to be themselves. At the end of the day, though, your children shouldn’t fear you, but they should sure as heck respect you. I think this is a great way for parents to stay grounded and prevent themselves from getting frustrated with their children’s actions, but doesn’t necessarily do the child any favours by perceiving you as submissive to them. I found your post two days ago and have applied this concept with my eight-year-old son twice since then. He has recently been complaining about EVERYTHING. Changing my viewpoint to see a positive motivation for his behavior, and verbally sharing that viewpoint with him, made a world of difference. He was visibly relieved each time, and the tension dropped significantly. THANK YOU. I like this article and way to reframe a child’s motives for you but I have one question about the scenario… Child picks up big rock. You tell him rocks are not for throwing and you are not okay with that. Child puts down big rock, picks of small rock, throws it. This is direct disobedience even though he DID choose a safer option. How do you handle that?